Do nice guys finish last? Digital marketing and happily ever after! | Happy Cards - Happiness & Kindness Cards! Do nice guys finish last? Digital marketing and happily ever after! 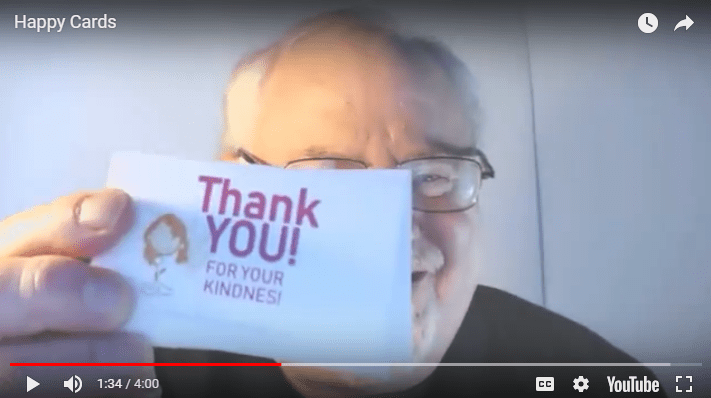 When I started to build this kindness for happiness program I started asked a few people in the advertising business what they thought because I wanted to do what I could to make sure I succeed. One response I got was that you seem like you’re being too much of a nice guy Joe. You need to find what people are scared and upset about in life and really bang hard on their “pain point”. I thought about it and thought about it before I replied. Here’s what I came up with. I am a nice guy. The world needs more nice guys. Someone once said “If you think nice guys finish last, you don’t know where the finish line is.” Can you imagine living in a world where being told you’re too much of a nice guy is a bad thing? It reminds me of when I was in high school and these two guys were bullying this one girl in class. I stepped in and stopped them and the teacher pulls me aside and told me Mr. Segal you’re too much of a nice guy. You belong in one of those richie rich schools like Beverly Hills High. But that never stopped me from stepping into help the bullied and reaching out to the different or teased kids to offer encouragement and friendship. So I told the well meaning digital marketing adviser this. Hey, I hear you. Hit them hard! Scare the crap out of them. To me sir, it sounds like don’t just hit their pain point, find their personal wounds and stick your proverbial knife in and twist it a bit. That’s modern digital advertising 101. I get that. Problem is though, that isn’t who I am. It is contrary not just to my mission but my entire being. This Happy Cards startup and my entire life is about making things better and spreading more kindness in the world. It’s based on academic research into the power of gratitude and appreciation and it really does work! I told him I know you’re trying to help me and I really truly appreciate that. I’m certain he meant well. And you can probably sell more stuff if you scare people enough about their fears and pain in life. Everyone’s trying to find ways to make more money and cut through the noise online to sell stuff. Everyone in online marketing also say be authentic, be yourself. Well, this is me. It grew out of my own life experiences with giving people these thank you cards and watching my life and theirs change. It grew out of my own anxiety and depression about my struggles in life going away as I engaged with people every day in my community to express kindness and gratitude. And it grew out my seeing so many people around my community living in degrees of anxiety to despair over not feeling they matter to anyone, that their low paying busy work jobs were drowning their dreams. I gave these cards to people in line at the pharmacy to people who were worried about a multitude of health problems, just like me. And they smiled ear to ear and said the same words to me “You just made my day!”. It felt great. They felt great and so did I. I felt like I really came alive when I was connecting with people with these tiny acts of kindness and appreciation. And I saw the same thing in their eyes! We connected at a very human level. Our political party or who we voted for didn’t matter. Nothing mattered but a small moment of human kindness and connecting to acknowledge the person beside us exists and is important. I was advised to be more hard hitting to sound like I really meaning it. I do mean it. I do. I’m just not going to use digital marketing hardball scare tactics to promote my mission of kindness and healing. Every person who gets these cards responds with kindness and appreciation. And the other thing most of them say besides “you just made my day” is “this is just what the world needs more of! And I think it really is! Don’t you? That’s why I hope you’ll get some of your own Happy Cards and experience being part of something really special. Because you are special and you really do matter, we all do! I am looking forward to seeing you become very successful so you can show the marketing companies that they don’t need to add to the fear and pain out their just to make a profit. I hope you show the world that you can do good by doing good. The world needs more of that now more than ever. Thank you Leonard! So I am.